Altcoin Buzz project review team's in-depth analysis of VisionX, a sustainable blockchain based incentive ecosystem that aims to boost the best AI solution and dataset across each industry for every user. Is VisionX in a strong position to tackle the AI Blockchain industry? VisionX is providing a sustainable and incentive-driven blockchain based ecosystem that creates a bridge for companies and organizations to utilize top quality AI and data solutions across multiple industries. The back-bone incentivised model is made up of two aspects: The initial Token reward and future profit sharing to reward contributors for their contributions to AI projects including AI dataset building, AI solution building and more. VisionX is aiming to allow for companies and organizations throughout the community to collaborate in creating AI solutions to common challenges whilst simultaneously creating customizable solutions for their own more specific use cases in many industries including consumer electronics, steel, mining, automobiles, aviation, medical supply and more! Some of the key focuses are supply chain management, predictive maintenance, pick and place robotics with the current focus being on visual inspection. 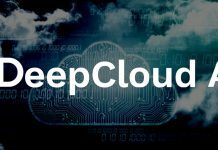 It is built upon the patented edge computing architecture on a Decentralised AI cloud of the DeepBrain Chain ecosystem and is being incubated by the DeepBrain Chain foundation along with being managed by the executive team members of the DBC foundation. Chuanfeng Lee – President of Foundation – Co-founder and CMO of DeepBrain Chain and Yi YU Intelligent. Background in Environmental Engineering and Urban/Rural planning management. Dr. Dongyan Wang – Co-Founder – Chief AI officer, Executive VP of Silicon Valley AI and Blockchain Centre. Vice President & GM for Global AI leader Midea Group + many more senior roles. Education Doctor of Philosophy along with Masters in Engineering specializing in AI image processing, Neural network and more. Business Experience working as Senior Director in NetApp leading Enterprise solutions and innovation organization along with IT director at Cisco managing large complex enterprise scale initiatives. Dr. Harry Gu – Co Founder- Senior Director of AI applications for DeepBrain Chain. Worked in RD and management experiences with AI for over 30 years at notable companies such as Panasonic and Midea Group + more. PHD in AI and Intelligent Robot. Hua Zhou – Principle AI Engineer – Staff AI engineer at Midea America Corp along with Principal Engineer at DeepBrain Chain. Experience in Design engineering at Invecas and Microsoft + more. Degree in Electronics from Southeast University. Dr Yu Zhu – Senior AI Engineer – Currently Senior AI engineer for Midea Group along with pervious work as Research Engineer. PHD in computer Science along with BE in Software engineering. Dr. Wanxin Xu – Senior AI Engineer – PHD in Electrical Engineering from University of Kentucky. Bachelors in Communications engineering. The DBC technology developers are building the VX chain platform and there a multiple developers which can be found here. Rhyan Cook – Global Community & Market Development – Overseas Director of Business Developent and Community relations for DeepBrain Chain. Founder of Oasis Virtual Reality and Kritque 3D with experience as customer support specialist with Kogan prior to that. Yong He – CEO of Yi Yi Intelligent Technology along with being the CEO of DeepBrain Chain. Multiple managerial positions and advisory positions. Hongquan Jiang – Board member for Graphcore, Sensoro + many more technology based firms. Partner of RBVC venture capital firm. Kang-Hyun Jo – Professor and Researcher – Researching computer vision, robotics, Vision based intelligence + more. The founders and management team of VisionX have great experience in AI platform and solutions. With a mix of both managerial experience, engineering and more they create a strong base for a founder’s group. The President of the Foundation seems to however lack business experience with his expertise laying regarding marketing and urban planning however to counter that, CAO Dongyan has business and market development experience working with Cisco and NetApp which is impressive with the Customer Intelligence solution he led for Cisco added over $1b annually through data analytics, data mining and value engineering. The technology team is outstanding, from the range of senior engineers, to computer vision experts and PHDs in computer science along with the endless development team backing them from DeepBrain Chain – the technology team is seriously strong and we feel more than capable of making this project a success considering such a large aspect is the future solution and large scale adoption of AI use cases. The team is let down in the business sense with only one listed business role being the community and market development leader who has limited experience in management of a business this scale along with no support of other business development managers and financial equipped individuals. Although there is a mix of relevant AI business experience amongst the founders such as Donyang it would still be great to see some additions in this regard to help in the adoption and growth of the project. Great to see the CEO of DeepBrain Chain being involved in DECO’s first incubated project with his numerous experiences in managerial roles and connections within the AI Industry and blockchain will help greatly in the growth of VisionX. The other advisors have a good mix of technology and financial experience however it would be good to see a few more business orientated advisors along with potentially a few more who have been a part of other projects not just DBC. Overall the team is incredibly strong from a technical standpoint of AI and although direct blockchain experience within is not overly prominent the incubation through DBC makes up for it. The lack of business members in the team limit it’s strength and we hope to see more introduced soon. The experience most team members have from working in DeepBrain Chain along with other companies such as Midea Group will have a great impact on the project’s future. The main idea of Vision X is to provide high-performed AI common solutions and a global data solution lake to allow any individual, company or organization to collaborate in creating customized AI solutions to specific industry use cases. Initially the focus will be on visual inspection abnormality and eventually expand with the data lake growing in line with users and contributors VisionX will be able to provide AI application for various industries far expanding visual inspection. The way of incentivizing the utilization and contribution to the network is broken down into three aspects. These being participants benefiting from the cost savings of utilizing superior AI solutions in their business, Receiving VNX token for contributions to the data ecosystem along with the potential for new sales of AI solutions built with contributor’s data allowing for future profit sharing through smart contracts. The AI solution token incentive is distributed among the data contributor 15%, AI solution/dataset builders 6% and VisionX Foundation 20%. With multiple companies seeking solutions to issues however individual AI solutions being too expensive along with single AI providers not being able to acquire enough data to provide these solutions – VisionX aims to fill this gap in the market. Vision X also has a patent pending for AI and Dataonomy algorithms. There is an interesting video posted on the VisionX YouTube presenting VisionX and their aim of disrupting the AI industry which can be found here. The AI industry is rapidly growing and currently considered significantly underserved. With intelligent manufacturing expected to reach $4 US trillion by 2020 along with Visual inspection, predictive maintenance and robot object pick and place totaling over $400 billion by 2020. There Is a large growing demand for AI and adoption into real life businesses will be imperative in innovation moving forward. With VisionX aiming to provide a global data lake to manufactures around the world in different industries to take advantage of AI and create innovative solutions for their business it will solve and reduce many existing costs in the market. For example, currently in China there is 60 million quality inspectors costing over $350b per year which could be largely offset with the use of quality and readily available AI technologies. 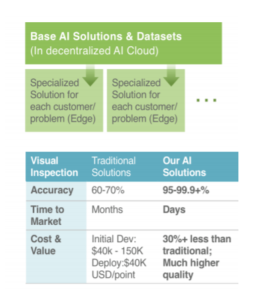 Although current competition outside cryptocurrency is growing there is distinct advantages of blockchain AI solutions over centralized solutions such as IBM visual inspect including ensuring data within the network is accurate and using an incentivized model. 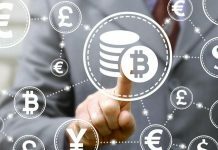 Competition within the cryptocurrency market is relatively strong however early movers today seem to have a strong advantage. 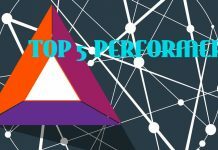 Ocean Protocol, Vechain and Ambrosus are three competitors which each have solutions for industries attempting to scale and solve issues however lack the use of AI to assist in creating these solutions. 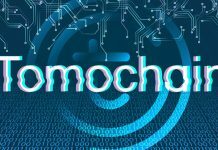 In comparison to Ocean Protocol there will be the similarity of storing data and paying users for sharing their low value data however differentiate themselves by using Dataonomy to categorize and annotate data until the AI can do so itself. Vechain is the largest with most adoption and growth however the lack of AI implementation is the major difference here. 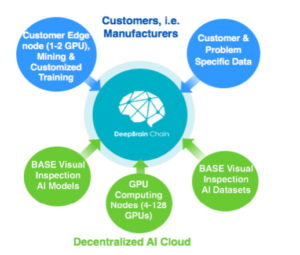 Other than the technological differences DeepBrain Chain Foundation and VisionX are aiming to improve the adoption and take market share through utilizing industry partnerships in industries such as cars, robotics , mining, steel manufactures and more. From the competitors in the current market, Vechain is the only one with a notable MarketCap with Ambrosus sitting at around $30m and the DBC who is incubating the project only at $10m. The main foreseeable business challenge for VisionX will be the awareness and adoption of their platform. The AI data lake will increase in strength as more people utilize it along with the data only being of value with more people demanding it. 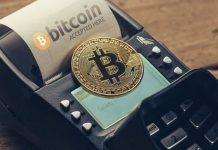 This struggle to increase adoption and awareness will need to be solved and the current situation with the lack of business members is not ideal in helping. From a regulatory and safety perspective there may also be hurdles with what industries can utilize certain AI solutions and the journey of people being averse to change. The utilization of incentives for companies and organizations to use the network are implemented to offset the ‘risk’ of switching to a new solution. The end solutions is where the real value lays and in reaching that point there could be large hurdles to adoption and growth. The whitepaper is detailed – it explains the idea, concept, the technologies expected to be used, how the data pools will work, the token utility, roadmaps, metrics and more. You can read it here. VisionX has been backed by a top 100 fortune Company VC investment and strategic cooperation which is yet to be publicly released. 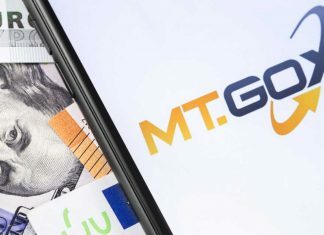 They are also backed by Gobi Partners – professional VC firm focusing on investing in Scieince and Tech projects and many strategic investors along with DeepBrain Chain and Hello Capital. They have also partnered with China Coal Technology & Engineering Group Corp in which have over 5000 mines within China which will require its DBC computing power and VisionX AI solution and system to analyse and provide enhanced outcomes for their coal mining production. Bishijie has also been partnered with in which is a Cryptocurrency and blockchain news platform in China along with providing software for its services. 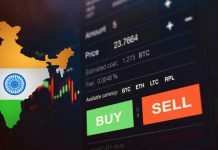 The recent Exchange listing on both L Bank and KuCoin are great for the network to grow and allow the greater buying and selling of tokens secondary to the airdrop and global data pool mining. This will allow for greater liquidity and incentive for companies and organizations to contribute data and create solutions. The idea of the global AI data lake seems like it will be in very high demand. With the scale of the current market along with the predicted growth in the industry VisionX could have a very large target market. The competition in the market and outside are growing however the differences VisionX poses regarding the level of AI sophistication and experience amongst the team executing is seriously impressive. 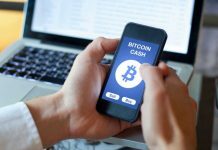 The current solutions being built by IBM and cryptocurrency projects such as Vechain lack this competitive edge. Looking at the growth and market cap of competing projects they are relatively low-mid which is not necessarily promising in the show of demand for such projects in today’s market, however moving forward and in the future, the real market is rapidly growing, and demand is high. 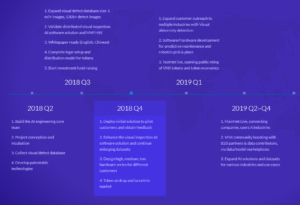 There are obvious challenges regarding the adoption and awareness of the platform along with the initial contribution to the global data pool which will allow for VisionX to grow exponentially. With the incentives to contribution along with the partnerships that VisionX is making such as the Chinese News platform and the Mines – this will help in the initial stages of user and contribution growth to give a strong base. The major current challenge of businesses either not being able to afford or paying too much currently and the data lake and AI solutions from a single provider not being accurate enough – there seems to be a real potential gap in the market for VisionX. The whitepaper is detailed and explains both the market and why VisionX is needed along with how VisionX will benefit and utilize its strengths to do so. Overall there seems to definitely be a market for this and it is in a rapidly growing industry. If VisionX can scale their platform and receive contributions to the data pool their will be high potential in large cost savings for companies around the world. The concerns link back to the lack of business minded individuals in the team and on the ground managers to help in this adoption and growth. Initially VisionX will be issued as an ERC20 token before it’s token swap to the DBC main chain. The initial target providing a solution to Visual defect inspection consists of Dataonomy which a computational method to categorize and extract large amounts of relevant data. it utilizes a decentralized cloud-edge AI computing architecture along with a hardware solution allowing for the adoption of any type of available cameras. With the use of automated data categorizing, Cross industry data sharing and AI solution building VisionX is able to create a both base level and specific use case level solutions. The use of blockchain allows the network to ensure the data captured is legitimate and comes directly from the true source along with being designed with an incentive mechanism in which users who submit data that is then used, will earn returns based off their participation amount. The inherent traits of blockchain in its immutability and auditability on the ledger allows for the verified ownership and connection of the contributed data to be tracked and allow for contributors to not only be rewarded from their initial contribution but also any on-going collaborated solutions utilizing their data. The smart contracts and ledger remove the need for any intermediaries and middle men in processing the contributions along with monitoring the solutions and ownership compared to current solutions. 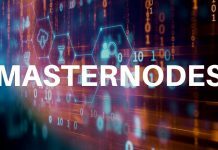 It also allows for the decentralised aspect of the data pool to be used all over the world in collaboration from individuals, companies and more. The token is used to access to the data lake in which will output specific categorized data to then be utilized by the user. On the other hand, the data captured in the network through the proprietary hardware and software will be filtered through and allow the capture large amounts of data but only focus on the important points relevant to clients. 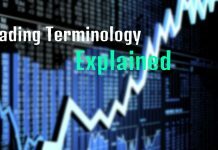 The token is essentially valued based on the size of the data pool and its inherent volume of data; The more and higher quality data the higher the demand for the token to access. In another future aspect, Smart manufacturing will allow users to connect to the VisionX network and receive payments for work completed such as 3D printing, laser cutting etc. There is a non-blockchain MVP released and the demo can be seen being presented here. With the initial focus being on the AI non blockchain aspect of VisionX the help of DeepBrain Chain blockchain expertise to incubate the project. Currently the initial AI solution is listed in the GitHub which can be seen here. The VisionX Test Net is expected to go live in Q1 2019 with the Mainnet during the second half of the year as per the roadmap! The utilization of blockchains underlying value propositions including the Decentralised aspect of the Global Data mining pool along with the traceability and verified ownership of contributed data and the incentivized token model is great use. The patent pending is good to see and will add another competitive edge to VisionX. The token utility is promising with both the incentives returns initially followed by ongoing rewards for contributed data that Is used. 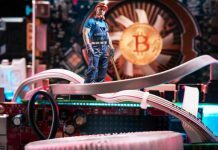 With the data lake growing and the demand of AI solutions doing the same the underlying blue of the coin can be expected to grow in line with the scarcity of the coin in the market and quality/volume of data. This is good to see as the value of the token should represent real underlying value of the access to AI data solutions. 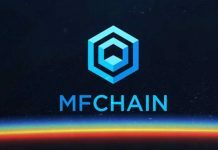 It is good to see the non-blockhain MVP however it would have been great prior to the listing and airdrop to have the test net complete to show the community the combination of the great AI tech and blockchain technologies. With majority of the hurdles laying in regards to adoption, the strong tech team are yet to come across any major hurdles. Overall, the combination of AI and blockchain by VisionX and their supporting team is great, with the only downside the later release of the test-net. The Twitter account has 920+ followers and is constantly active, posting about the project, taking part in the Air Drop and the general AI industry. The community initially was lowly engaged however the Air Drop incentive and marketing campaigns have increased this significantly. Most followers and the largest network is the Telegram with 19k members. Considering the project is an Air Drop this is skewed with a large number of members probably not contributing to the network past the initial drop. 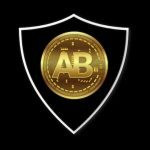 However, the conversation on the telegram is organic and the admins are responsive and helpful along with the Air Drop being given to many DBC holders who are active contributors in the AI space. The reddit has 348 members and a few posts regarding partnerships and the airdrop, not very active similar to the the Youtube which has little content however the two videos of the VisionX presentation and the demo are very interesting. There Is no Medium Account for VisionX and a fair amount of information regarding VisionX is portrayed through the DECO on DeepBrain Chains Twitter and Medium. There is a link within the DECO foundation in which any purchase of the DPT ICO will result in a 5:1 VisionX Air Drop. 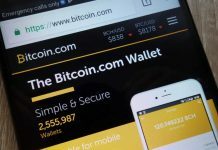 There Are few press releases of publicity about the project with few if any YouTube reviews on the project along with minimal third-party reviews by popular media channels. VisionX did appear at the Global Disruption Innovation Summit however limited exposure elsewhere. There Is a more technical focused breakdown of VisionX which can be found on Yahoo Finance here. 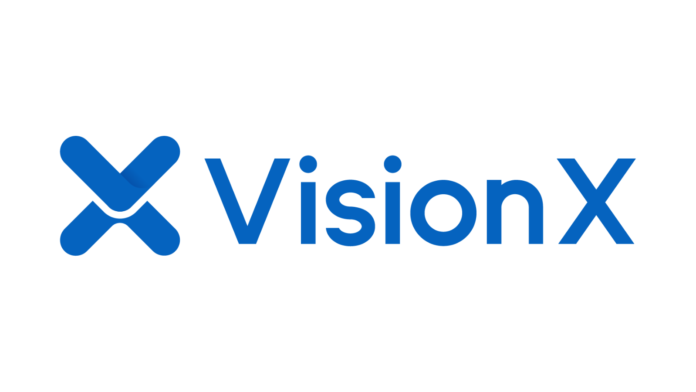 Considering VisionX is an Airdrop there is on-going marketing campaigns to raise awareness of the project such as the first 5000 active subscribers who have completed the assigned tasks will get free VNX along with a Pop Quiz for 18,888 VNX. VisionX are also expected to attend the Blockchain Expo North America in November along with DBC continuing to play a role in marketing campaigns on their media channels. There is also multiple trading rewards for the new exchange listings which is helping to promote the awareness of VisionX. Market hype is low for VisionX, it does not seem to be topical in the VC space along with YouTube Cryptocurrency community. Although a relatively new project the incubation through DECO will help in bouncing off their network and the good will built in the community as a strong and honest project. 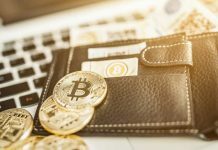 The sentiment is positive surrounding the project and the Airdrop has excited many people in the cryptocurrency community who are actively engaging. 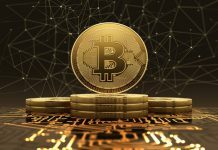 The current market trading seems unsustainable with the price sitting at above 300 Satoshis valuing VisionX market cap over $60m putting it in the top 100 which currently with it’s number of users and current data volume is not justifiable and the trading incentives for listing on the exchanges may have skewed this for now and it will be interesting to see the result after this drops off. The social media channels for VisionX particular the Twitter, Reddit and Youtube are relatively quiet. The Twitter page is growing at a strong rate due to the incentivized airdrop and exchange listing campaigns however a more organic growth based on interest in the project for its fundamentals would be more promising. The Telegram has a good following along with the community engaging, again similar to the above point it would be good to see organic non-incentivized airdrop growth and engagement throughout the social media channels. Having DECO to help promote the project will be very beneficial with large media channels, partnerships and trust built for the community which should flow onto to the VisionX project. With the lack of press releases and third-party reviews this will have to be increased down the road particularly with marketing agencies directly targeting users contributors of AI data. The on-going marketing is strong and good to see that past the initial listing they have plans to move forward and grow the project. With a backing from DBC, they have experience, funding and a backbone to move forward in the AI space and build the currently lacking hype and excitement about the project! There was a private funding round for VisionX in which tokens were sold for $0.01 per token. 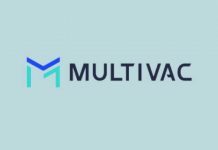 The remaining Public Sale will be an Airdrop for community involvement/engagement and contribution to the network. 3 billion tokens for Private fund raising with no lock ups or bonus. Looking at the roadmap VisionX is on schedule completing the technological and business aspect goals in the roadmap for Q3 2018. Moving forward into the current Q4 2018 there has been enhancements and the private fund reaching the cap allowed VisionX to change their mind and do an Airdrop rather than ICO sale. 2019 looks promising with the network going live and the tokens being minable. It is a shame the test net has not been available on the blockchain with a non-blockchain MVP only being available. With the private sale reaching its cap early in the process for VisionX they were able to decide to provide an Airdrop for the remaining tokens rather than an ICO. This is very good to see a project do and instils confidence in their motives and community interests. With the incentive driven airdrop of community involvement engagement and contribution this will create a good initial network for VisionX and provide a good Decentralised backbone. There is the negative that many Airdrop participants may dump their tokens upon release, however the market will determine the true value of VisionX based on the global data pool and the growth potential! 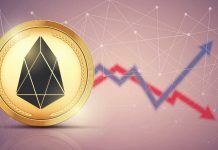 The fact there is no vesting period for the private investors although no direct bonus is not ideal with the $0.01 token already being traded at a 100%+ premium. 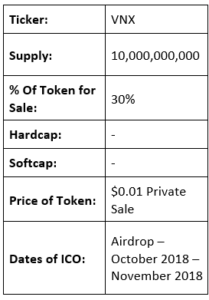 It is good to see the transparency of the usage of funds from the private sale along with the breakdown of the token supplies. The roadmap looking back and moving forward looks promising with achievements to date being met and the foreseeable goals being attainable. The only let down here is the fact of the test net being released post Crowdsale/Airdrop however is expected early in 2019. Overall with the project switching to an Airdrop we really like this as it shows they are happy with the funding received to develop and maintain the project and now focusing on the growth and adoption of the network. 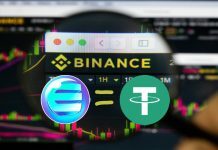 It will be interesting to see how the market reacts to the listings on exchange. With VisionX being Incubated by such a strong AI blockchain figure DBC it allows VisionX to use their network as a base and branch off to grow. With the common data pool already comprising of over 1 million images along with nearly 130k visual defects from 34 classes of 6 industrial areas they are in A strong position to begin the visual inspection aspect and attain market share. The cost savings are great, and this seems like a long term strong real business model. Overall VisionX is in a strong position to tackle the AI Blockchain industry. With the support of DECO they have some of the most experienced AI experts around along with the know how of the blockchain industry also. Utilizing DECO in the marketing, technology and partnerships will help greatly. The uses of the technology and the idea itself are interesting and seem like a good fit. With the issues of adoption and the initial growth of the Data Lake, if this can be executed correctly it will be very impressive and put them in a strong position. 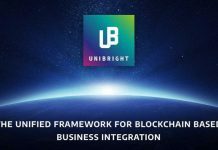 With the marketing being relatively quiet, we think it is time to focus more so on AI partnerships and users of the platform for its fundamental value rather than the airdrop participants. It would be good to see the business team expand and more financial orientated members be involved. 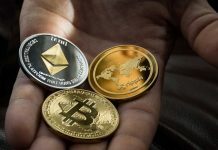 The movement to an Air Drop over an ICO is positive and VisionX Is a project to keep an eye on although the current market price and trading seems unsustainable for a new project. With a real-world issue being solved through the combination of AI and Blockchain it could have a large future. 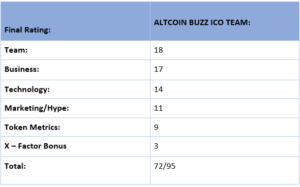 This analysis was produced by The Altcoin Buzz ICO Research and Analysis Team. Members: Shashwat Gupta, Andrew Grapsas, Mohak Agarwal with the help of other members of the Altcoin Buzz Team and Community. The information discussed in the Altcoin Buzz ICO review is not financial advice. The reviewers are crypto enthusiasts and not Financial Advisers. This information is for educational, informational and entertainment purposes only. Any information or strategies are thoughts and opinions relevant to accepted levels of risk tolerance of the writer/reviewers and their risk tolerance may be different than yours. We are not responsible for any losses that you may incur as a result of any investments directly or indirectly related to information provided. The system and numbers indicated are our own ICO rating metric and may be updated and changed according to what we believe the current ICO market trend to be. It is not to be taken as investment advice, do your own due diligence and rating before making any investments and consult your financial advisor. The reviewer may have or wish to invest and have an interest in the project reviewed. The rating is only indicative of the rating during a certain time and may have changed over time without being updated. The researched information presented we believe to be correct and accurate however there is no guarantee or warranty as to the accuracy, timeliness, completeness. 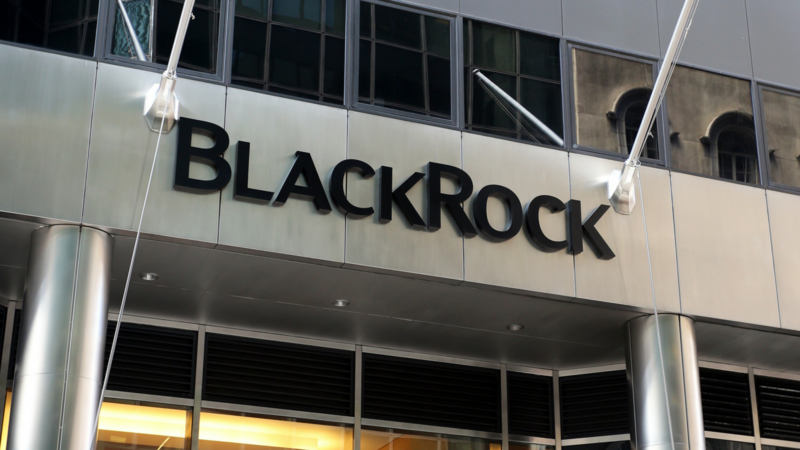 Bitcoin and other cryptocurrencies are high-risk investments so please do your due diligence. Copyright Altcoin Buzz Pty Ltd. All rights reserved. Direct Communication with VisionX and DeepBrain Chain Foundation team members.